I’m honored to have the chance to perform this Sunday in my hometown! Join us on the anniversary of the world’s first atomic test to experience Suspended Moment, a sculpture installation and Butoh dance and poetry performance by Los Alamos native Allison Cobb and Hiroshima native Yukiyo Kawano, with Butoh choreography/dance by Meshi Chavez, soundscape by Lisa DeGrace, and video projections by Stephen A. Miller. 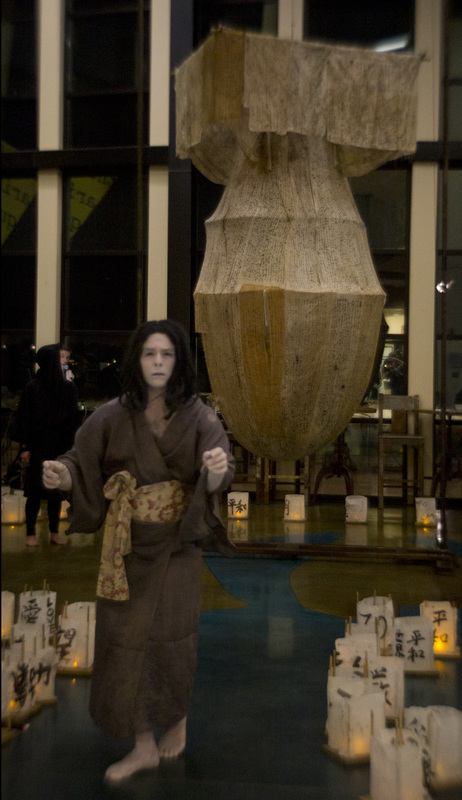 At the center of the performance is a life-sized sculpture of the bomb dropped on Nagasaki in 1945, created by the artist Yukiyo Kawano. Yuki was born and raised in Hiroshima, a third-generation atomic bomb survivor. She creates her sculptures from WWII-era kimonos that belonged to her grandmother, and sews them together with her hair, melding the DNA of generations of atomic bomb survivors. Co-sponsored by Los Alamos History Museum, Los Alamos/Japan Project, and Los Alamos County Library System. Funded in part by a grant from the New Mexico Intervention Fund of the National Trust for Historic Preservation. ← You want it darker?